Everything I speak is the truth and is backed up. Unlike you who change their story on every place you post at…..you can’t even stick to the same story. Now…I remember you mentioned Jack Goins site about Valentine…..and you mentioned me about my geneology. Notice the name Lewis Collins who was often around Vardy and Valentine. Since you like to always mention Jack Goins. Lewis Collins above was the son of John Collins Sr. Applied for a Rev. War Pension in Hawkins County, Tennessee. etc etc…check the site for the full story. The Broad River originates in the Blue Ridge Mountains of eastern Buncombe County, North Carolina and flows generally south-southeastwardly, through or along the boundaries of Rutherford, Polk and Cleveland Counties in North Carolina; and Cherokee, York, Union, Chester, Fairfield, Newberry and Richland Counties in South Carolina. William1 Dobbins was born 17 Feb 1739/40 in Granville NC, and died 23 Sept 1814 in Rutherford Co NC (S:Texas Daughters Revolutionary Ancestors). He married Susannah Collins before 1762 in Granville Co NC, daughter of William Collins. She was born 27 Feb 1737/38 in Granville Co NC, and died 1 May 1832 in Rutherford Co NC. Now drury could have been wrong as to the exact place of birth of Susanna Collins. +2 James B.2 Dobbins, born 1762 in Granville Co NC; died 28 Mar 1843 in Cleveland Co NC. +3 William2 Dobbins, born 1765 in Granville Co NC. +4 Mary (Mollie)2 Dobbins, born 1767 in York SC; died 14 Oct 1854 in Spartanburg SC. +5 Frances “Fannie” 2 Dobbins, born 1773 in York SC; died 1863 in Rutherford Co NC. 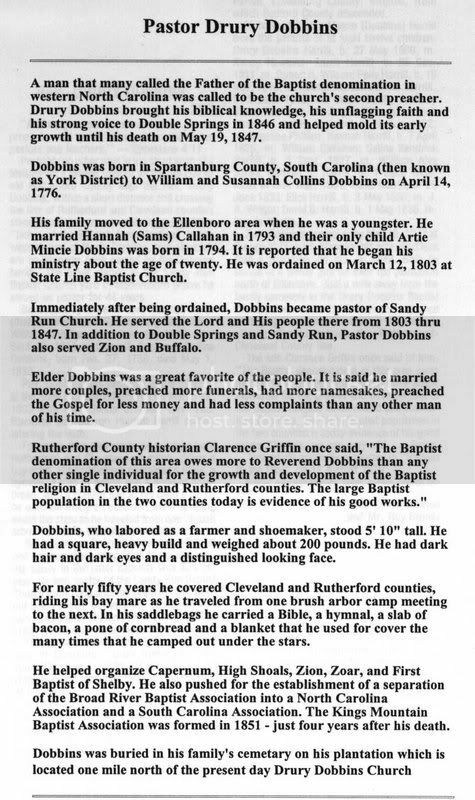 +6 Ezekiel2 Dobbins, born 1775 in Rutherford Co NC; died 3 Nov 1857 in Spartanburg SC. +7 Drury2 Dobbins, Rev., born 7 Apr 1776 in York Co SC; died 19 May 1847 in Rutherford Co NC. 8 Elizabeth2 Dobbins married John Hicks. (S:James O. Womack – Forest City, NC). +9 Jonathan2 Dobbins, born about 1780; died after 1870.
looks like Rutherford NC’s Collins and William Riddle asland transactions together…..William collins was the brother of Susanna Collins (he is in the bible of Drury Dobbins). All above Barbers, Collins, Chance, Mackey…..all listed as free persons of color. All them Collins was Free person of color also. Benjamin and Mary Jane Mackey had two sons and three daughters aged one to seven years by 1860 (Federal Census, 1″0’60), but the 1870 census listed only two daughters remaining in the household (Federal Census, 1870). Napoleon Mackey’s grandmother was Clarissa Mackey and his grandfather was Washington Hearse. Nothing could be determined from the Hyde County Records concerning Washington Hearse. Napoleon Mackey’s parents were Benjamin J. Mackey and Laura Lu Mackey. Laura Lu Mackey was the daughter of Henry Barber and Hettie Mackey (Hyde County Marriage Records). Napoleon Mackey married Geneva Burrus in 1921. His wife apparently has no claim to Indian ancestry. Napoleon Mackey, when interviewed in 1975, asserted his knowledge of his Indian ancestry, and named several other Hyde County families which he believed could also claim at least partial Indian descent. Prominant among those were the Collins, Barber, Chance, Clayton and Bryant families (Napoleon Mackey 1975). Settlement pressure by whites was the greatest problem that the Indians at Mattamuskeet faced after the Tuscarora War. King Squires and King Mackey of Mattamuskeet requested that their lands be surveyed and conveyed as a formal grant to the group in 1724. The Colonial Council concurred with this request, and ordered the surveyor general to survey a four mile square area for the reservation (Johnson 1972, 212). The land grant was not formally approved by the Council until 1 April 1727, and it is apparent from the wording of the grant that the reservation had not been surveyed as ordered by the Council (see appendices 3 and 4). Tony Mack is Tony Mackey. 1742. Sundry Indians, among them Manincassa, Captain Tom, Blind Tom, Foolish Zack, and Little Zack, were before Court for “terrifying” one Lawrence Strother, who testified that one of them shot at him, that they tried to surround him, that he turned his horse and rid off, but they gained on him till he crossed the run. Ordered, that the Indians be taken into custody by the sheriff until they give peace bonds with security, and that their guns be taken from them until they are ready to depart out of this Colony, they having declared their intention to depart within a week. They gave bond. I should also mention that in 1790 rutherford…there was Bollings living there also. Anyway…..let’s go back to where Susanna Collins’ son went to church….the Zion Church. Originally much of the area of present northwestern South Carolina, was known as Cherokee land. In fact, the lower Cherokee nation was centered in this territory. The capital village of the lower Cherokee nation was known as Keowee (from which we get the name Keowee River — and now Keowee Lake). When Lake Keowee was built in the nineteen sixties, the area where this village was located was flooded. The Keowee River is the boundary between present Pickens and Oconee counties of the Upstate. Present Greenville County was definitely part of the lower Cherokee nation. The area of present Spartanburg County, belonged to the Cherokees as well but served mostly as a buffer between the Catabaw Indians and the Cherokees. William Foster, or Major “Billie”, as he was called, moved to the Upcountry in 1791 from Amelia county, Virginia, and settled a mile or so east of Mt. Zion Baptist Church, which was near Fort Prince in the Spartanburg District. (Note: we will stop right there for a minute…..did the Saponi and Catawba visit each other….yes thereis stacks of documents to back that up). How far down the rabbit hole you want to go Don……or how far are you willing to go lol It’s not called rewriting history when a person quotes from historical records found at any national archives building. 1699 Bear river tribe articles of agreement. Signed on be half of the tribe by. George Fisher, Captain Gibbs, and Lewis Vandermullen. Bear River tribe was later incorped into the Hyde county, NC Machapunga tribe and thus given the name Mattamuskeet. Did the Saponi also speak algonkian….yes…..after their return from North Carolina they was speaking both Siouan and Algonkian. The word list of the Saponi reservation after the Saponi returned to Virginia from Bertie county, nc’s area as they was recorded by fountain. breeches, lonoughte Saponi (Fontaine 1716). brother, ohenopse Saponi (Fontaine 1716). coat, opockhe Saponi (Fontaine 1716). come here, kihoe Saponi (Fontaine 1716). come to bed, conopanan Saponi (Fontaine 1716). eight, massons Saponi (Fontaine 1716). eighteen, [os massons] Saponi (Fontaine 1716). eleven, os nacout Saponi (Fontaine 1716). fifteen, [os prance] Saponi (Fontaine 1716). five, prance Saponi (Fontaine 1716). four, jow Saponi (Fontaine 1716). fourteen, [os jow] Saponi (Fontaine 1716). gun, mikta Saponi (Fontaine 1716). hat, apato bokso Saponi (Fontaine 1716). how d’ye do?, jog de log Saponi (Fontaine 1716). I am going to be sured(? ), joquahingnomotsonan Saponi (Fontaine 1716). I thank you sir, ketemaghketersinaw Saponi (Fontaine 1716). is this the way to the horse head, hodke tock ire chunkete posse Saponi (Fontaine 1716). my dear wife, mihu mima mikito Saponi (Fontaine 1716). my service to you queen, kenepaskiniwiky Saponi (Fontaine 1716). nine, ketaugh Saponi (Fontaine 1716). nineteen, [os ketaugh] Saponi (Fontaine 1716). no, metaugh Saponi (Fontaine 1716). one, nacout Saponi (Fontaine 1716). otter, mosnukhe Saponi (Fontaine 1716). powder, mahinkt Saponi (Fontaine 1716). powder horn, tabike Saponi (Fontaine 1716). presently, inking Saponi (Fontaine 1716). seven, tappons Saponi (Fontaine 1716). seventeen, [os tappons] Saponi (Fontaine 1716). shirt, opockhe hassa Saponi (Fontaine 1716). shoes, agohele Saponi (Fontaine 1716), makasoons Saponi (Fontaine 1716). shot, mankey Saponi (Fontaine 1716). shot bag, miktoke Saponi (Fontaine 1716). six, quiock Saponi (Fontaine 1716). sixteen, [os quiock] Saponi (Fontaine 1716). snake, moka Saponi (Fontaine 1716). stay, monotisnock Saponi (Fontaine 1716). stockings, honis Saponi (Fontaine 1716). sun, the , my Saponi (Fontaine 1716). sword, impough Saponi (Fontaine 1716). ten, metough Saponi (Fontaine 1716). thirteen, [os nos] Saponi (Fontaine 1716). three, nos Saponi (Fontaine 1716). twelve, [os tock] Saponi (Fontaine 1716). twenty, takabosque Saponi (Fontaine 1716). two, tock Saponi (Fontaine 1716). water, money Saponi (Fontaine 1716). what you please, ikiron Saponi (Fontaine 1716). wig, machneto dufas Saponi (Fontaine 1716). will you kiss me?, ke ly pomerin Saponi (Fontaine 1716). yes, keneha Saponi (Fontaine 1716).